The Congress has won 15 and is leading in 88, the BJP has won ten and is leading in 60. Follow The Wire’s live coverage of the 2018 assembly election results here. New Delhi: The Congress looks poised to form a government on its own as it is leading in 88 of the 199 constituencies polled, with the Election Commission declaring 15 wins for the party. The BJP is trailing with ten wins and leads in 60 constituencies. The Bahujan Samaj Party (BSP) has won three constituencies and is leading in another three. While over 1.05 crore votes have been counted in Rajasthan, the difference between total votes for the Congress and BJP is just about 12,000. As per EC data, all three most prominent leaders in the state have won their elections. Chief minister Vasundhara Raje won from Jhalrapatan, former CM Ashok Gehlot from Sardarpura and Pradesh Congress Committee president Sachin Pilot from Tonk. Chief minister Vasundhara Raje has taken a big lead over Manvendra Singh. The Congress’s C.P. Joshi is holding a narrow lead of just 769 votes from Nathdwara after round two. Jaipur’s mayor, BJP’s Ashok Lahoty, is leading from Sanganer after round one seat by 1,163 votes. 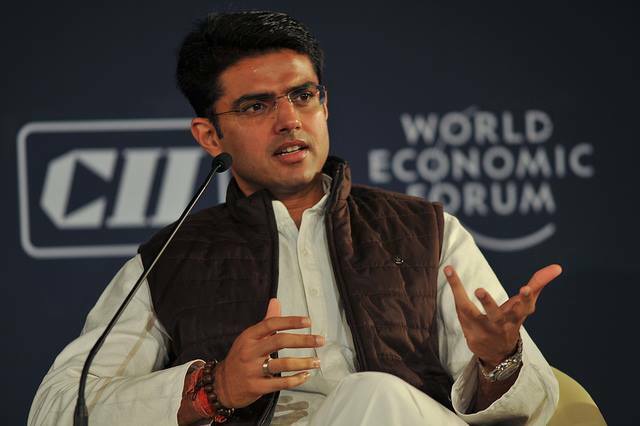 Former union minister Sachin Pilot, who was handed the task of rebuilding the Congress in Rajasthan after the party received a drubbing in the 2013 Assembly elections, is leading from his Tonk constituency. Top candidate for the CM’s post, he is taking on BJP’s lone Muslim candidate in the state, Yunus Khan. As voting for the 200-member assembly ended on December 7, all exit polls predicted a victory for the Congress in Rajasthan. For the last few decades, the state has voted out the party in power after a single term. A Congress victory is likely to re-affirm this trend. There are nine major regions in Rajasthan – Ajmer, Dhundhar, Gorwar, Hadoti, Mewar, Mewat, Marwar, Shekhawati and Vagad. The contest was between the arch-rivals – BJP and Congress. Both Vasundhara Raje (BJP) and Ashok Gehlot (Congress) are vying for a third term as the chief minister. However, Gehlot may be passed over for the top job in favour of Sachin Pilot, head of the state’s Congress unit. While Raje had continuously reiterated that her government brought about unprecedented development and social welfare in the state, the Congress campaign claimed that hate crimes, farmer distress and unemployment shot up under her leadership. A major issue that resonated with the voters was the agrarian distress due to onerous and outstanding debts, persistent unemployment. The spurt in hate crimes against minority communities and the reservations of Jats under the OBC category were also discussed. These issues featured prominently in each party’s manifesto. While the BJP argued that the issues were adequately addressed during its rule, the Congress felt otherwise. Another aspect which went against Raje was her government being frequently accused of preferential treatment and corruption. The chief minister’s efforts to protect judges and bureaucrats from public scrutiny had also invited criticism. The Congress is likely to benefit from general disaffection with the BJP due to its failure to redress these issues. The party felt this would be enough to turn the tide in its favour, and exit polls suggest that this may be the case. Raje, on the other hand, may have more to worry about. She came to power riding on the Narendra Modi wave, which many believe has since waned. Rajasthan has a peculiar electoral past. The Congress was victorious for the first five assembly elections and Mohan Lal Sukhadia remained the chief minister for 17 years till 1972. Since 1993, voters have vacillated between the Congress and the BJP. The Congress was in power in 1998, and then in 2008. Both times, Gehlot was the chief minister. The BJP was in power in 2003 and then in 2013, with Raje as chief minister for both terms. Raje came to power in the last assembly polls by winning a record 163 seats in 2013. The Congress managed to win just 21 seats.